MY Contessa Mia is a classy, well-appointed liveaboard with an emphasis on southern week-long Red Sea diving cruises from Hurghada or Port Ghalib. With a maximum of 20 passengers and 12 crew, you can expect quite an intimate experience with plenty of personal service. Guests can relax in the main deck saloon or on the upper deck saloon/dining area, both of which are air-conditioned. The main deck saloon features high-end audio visual entertainment facilities and a free internet facility. The cabins are all en-suite and the same price and are twin share, with 8 being on the lower deck and 2 on the main deck offering better views and more natural light. The dive deck is very large and with wooden bench seating around the perimeter with diver stations and central hanging rails, meaning there is plenty of space to move around when kitting up. You will enter and exit the water at the dive platform where there is a rinse tank for camera and 2 fresh water hoses. The well-maintained interior of Contessa Mia is furnished in teak with comfortable seating areas. The main outdoor social areas are the shaded outdoor space on the upper deck and the large sun-exposed sun deck with sun mats and sofa-bench seating. If you are looking for a quality Red Sea liveaboard experience with an experience diving cruise operator in Hurghada, you can count on the MY Contessa Mia. Special offers: For special discounted prices, check the yellow highlighted trips in the schedule above. Notes: Recommended diving experience (not mandatory): North & Wrecks safaris - Open Water diver license and 20 logged dives; for St. Johns Reefs safaris - Open Water diver license and 30 logged dives; for Brothers, Daedalus Reef & Elphinstone safaris - Advanced Open Water diver license and 50 logged dives. Cruise price per person includes: Cabin accommodation with air-conditioning, breakfast, lunch, dinner, snacks, drinking water, soft drinks and hot drinks (e.g. instant coffee, tea), experienced English-speaking divemaster(s) (10 scuba divers per DM), tanks, weights and weightbelts. Port Ghalib jetty fee: US$ 28. Unless otherwise stated, all the listed items need to be paid on arrival (cash or credit card). Optional extras: Visa service (US$ 28), return transfers from Hurghada or Marsa Alam Airport to boat, alcoholic drinks, enriched air nitrox for EANx-certified divers (USD 6 per tank/USD 56 per week), torches. Unless otherwise stated, all the listed items need to be paid on arrival. How to get there: MY Contessa Mia departs from Hurghada and Port Ghalib and return transfers from Hurghada and Marsa Alam airports to the departure point can be arranged at additional cost. Check in time starts 17:00 hrs on the first day (boat departs the next morning). Check out before 12:00 noon on the last day (last night usually on the boat in the harbour). Late arrivals or early departures can be arranged. There are direct flights from Cairo to Hurghada (1 hour) and Marsa Alam (1.5 hours) via Egypt Air. From certain destinations in the UK and Europe it is possible to fly into Hurghada and Marsa Alam direct. For more information see our travel information section for the Red Sea. The first and last nights of the itinerary are spent in the harbour. Guests arrive and board on the first day. The boat leaves the harbour on the morning of the second day. Full tourist visas are available only at the airport for citizens of certain countries, unless obtained in advance. Please ensure you understand the tourist visa requirements that apply to you. The last dive of the trip will be at around 13:00 hrs on the second last day of the trip. Please wait at least 18 hours before flying after diving. Single supplement (if you do not want to share accommodation): This is optional - single travellers may choose to share a cabin or pay a supplement of 100% of the published price. Dive clubs and group discounts: Pay for 10 guests and 1 extra person can join the cruise in a Standard cabin free of charge (total 11 or more guests). See whole boat charter rate below which is approximately equivalent to pay for 15.5 guests and 4.5 additional persons can join the cruise free of charge. 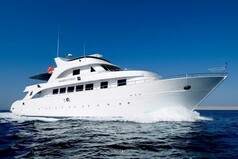 Whole boat charter rate (per night): Red Sea North & Wrecks - US$ 2 209, St. John's - US$ 2 310. For alternative trip prices please check with us. Add-on package: If you have time, we strongly recommend that you consider some of the wonderful antiquities tours in Egypt which can add a whole new dimension to your holiday. Cairo museum's royal mummies, the pyramids of Giza, the Great Sphinx, a glorious cruise down the Nile staying in a luxury cabin, The Valley of the Kings, all of these and more can be seen in packages starting at 6 nights' duration. Other activities such as 4x4 safaris and camel tours are also available as are custom-made packages to suit your needs. Contessa Mia has 10 Standard twin bed cabins, 2 on the middle deck with windows, and 8 on the lower deck with portholes. All the cabins have private en-suite bathrooms. All meals on MY Contessa Mia are served buffet-style and are prepared using the freshest ingredients. The menu comprises international cuisine and a range of interesting Egyptian and Arabic specialties. As well as pasta, vegetables, rice and meat dishes, you can enjoy local salads and freshly prepared Egyptian desserts and pastries. There are 3 meals a day, plus snacks after the 3rd dive of the day. Main meals consist of breakfast, lunch and dinner, with snacks in between. The menus are fixed and meals are served buffet style in the air-conditioned restaurant on the upper deck. Snacks include candy bars, biscuits, fruit and fresh afternoon snacks. Tea, coffee, soft drinks and drinking water are free of charge. Tonic, soda water, beer and wine are available for purchase. All diets, including vegetarian and halal, can be catered for with prior notice. Catering begins with dinner on first day. Customer rating: Be first to rate!